Linda Hesler from the Arizona Republic writes a nice little story on Janet Clarke aka "Helen Wheels" who skates for the Bruisers of the flat track Arizona Roller Derby league. Mikey Dancziger won't be pushing his teacher's buttons anytime soon. It'll be nothing but his best behavior after he watched his language arts instructor at Deer Valley Middle School block and jam and duke it out with other all-female roller derby skaters at a recent bout at Castle Sports Club, on 19th Avenue north of Peoria Avenue in Phoenix. "She was awesome," the 13-year-old said, referring to teacher Janet Clarke, who goes by the rink name of "Helen Wheels" when she skates for the Bruisers. "In the classroom, she's a really cool teacher and she really never gets mad," Mikey said. "But after watching her (skate), I'm hoping she doesn't." Not only is roller derby back on the scene with a vengeance, so is Clarke, who would just as soon bop her opponents as make a legal block. Andrew Cleland, 13, saw Clarke, too, just to see whether she was "just talk or actually good." He has decided upon the latter. The comeback of the once obscure sport - there are five female roller derby teams in the Valley - has allowed Clarke to fulfill a lifelong dream. Raised on skates, Clarke can't remember when she first started rolling around a rink. "But I have pictures of me on skates when I was 18 months old," she said. Bu$hCo. ready to slash poor people anti-poverty programs. Advocates for the poor, however, contended that the White House is trying to gut federal programs for the poorest Americans to make way for tax cuts, a mission to Mars and other presidential priorities. Administration officials would not say how much the consolidation would save, but it could lead to steep funding cuts. That is because the HUD programs would have to compete for resources in Commerce and Labor budgets that are not likely to expand to accommodate the shuffle. "I'm always willing to look at consolidation, but clearly they're using consolidation as a shield for substantial budget reductions," said Rep. Barney Frank (Mass. ), the ranking Democrat on the Financial Services Committee, which has jurisdiction over housing and community development programs. The plan was detailed in a December memo from the White House Office of Management and Budget to HUD. The document provides one of the first concrete examples of the types of cuts in the works as the administration comes to grips with a soaring deficit. Congressional housing aides say the $4.7 billion Community Development Block Grant (CDBG) program -- the bulk of the community planning budget -- could be cut as much as 50 percent. Cities have become dependent on HUD's development programs, especially the CDBG, which has existed for 30 years, city officials said. Stanley Jackson, director of the D.C. Department of Housing and Community Development, said the city has used CDBG grants of $21 million to $22 million a year for clinics, recreation centers, day-care facilities, literacy programs and housing development. With housing and property values skyrocketing, the need for such programs for low-income families has never been higher, he said. "If this is a backdoor way of eliminating a program like CDBG, it would have a profoundly negative impact on cities," said Jim Hunt, a vice president of the National League of Cities and a city council member in Clarksburg, W.Va. Under the plan, the CDBG program -- which provides multipurpose development grants to state and local governments -- would be sent to the Commerce Department. The Urban Empowerment Zones and the Renewal Community programs -- both of which offer tax incentives for development in urban or other troubled areas -- would also go to Commerce, as would the Brownfields Economic Development Initiative, designed to revitalize abandoned industrial sites. 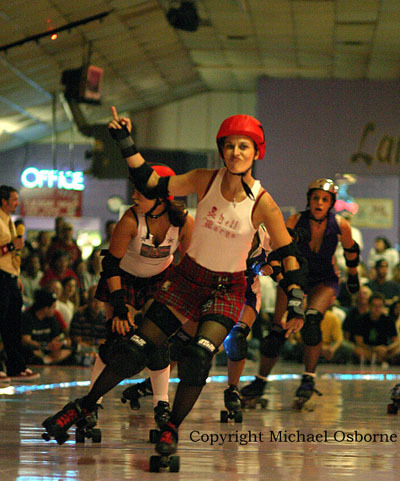 The Minnesota Rollergirls will debut their four teams with a demonstration roller derby bout on January 16, 2005.
happy birthday crusher and misty meaner !!! Texas Rollergirls "Crowd Favorite Award"
The fight Crew of the L.A. Derby Dolls are trying to raise some funds on eBay. Items up for bid include jackets, t-shirts, some dresses and skirts. (I've got my eye on this). Check out the Fight Crew's auction here. D.C. officials said yesterday that the Bush administration is refusing to reimburse the District for most of the costs associated with next week's inauguration, breaking with precedent and forcing the city to divert $11.9 million from homeland security projects.